The facility includes three studios that YouTube partners from the YouTube creator community throughout London and Europe can now use to generate content. In fact, YouTube Space London is offering "Short Shoots", which are one-day productions available to any YouTube creator whose channel has more than 10,000 subscribers. A short shoot production gets free access to one of the studios. YouTube Space London includes a 500 sq ft green screen stage, plus two larger studios measuring 800 and 1,200 sq ft respectively and include a mix of 90W, 180W, 270W and 360W versions of Photon Beard Highlight LED remote phosphor lights, which augment existing lighting already owned by YouTube Space London. The smaller, 90W versions are installed in the green screen space and 360W models in the large studios. Apart from being state-of-the-art from top to bottom, what makes this installation so significant is that it marks the world's first application of the Highlight LEDs, which use a new, Photon Beard-designed approach to remote phosphor technology. LED remote phosphor technology is a good solution for producing light that is suitable quality for image capture, but there are some subtle differences between television and film lighting that other remote phosphor devices do not address. Most other devices produce a lot of light from a flat panel at the front of the fixture. This then outputs a beam angle as much as 160 degrees, which can easily oversaturate a space with light. In short, the light beam is too broad and casts far more light than you would wish for a studio-based, television in particular, productions, which tend to focus on one or two characters. Remote phosphor technology has been around for a while, but what makes our Highlight LED approach different is that we've taken the best available remote phosphor technology and combined it with a unique way of altering the optics, which makes it a very punchy, full spectrum LED luminaire with excellent CRI and TLCI. The Highlight LEDs relate directly to 2,4,6, and 8 tube fluorescents and all the advantages those offer, but with far more 'punch', and without the unnatural tones usually found with many LED fixtures. YouTube Space London wanted, above all else, high quality lighting that was focused and consistent, both of which are particularly crucial aspects for studio productions. 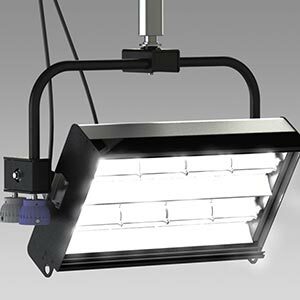 And because Highlight LEDs have no moving parts and are passively cooled, they cost far less to run which has the added benefit of lower operating costs and superior ease of use. For example, colour temperatures can be easily changed by simply swapping phosphor panels, which is quick and convenient. Our sister company, Projects Department, also custom-designed and supplied the lighting suspension systems in Studios 1 and 2, which includes a motorised truss solution using an ATC truss and Doughty motor/gearbox hoists. Studio 3 and the common spaces were equipped with a single level lighting grid with integrated power and DMX controls. The lighting control is also custom-designed and includes a touch screen and wireless app solution designed by Eaton/Zero88 that uses SCD servers to interface with either a touch screen in the studio or, for larger control requirements, by either an FLX in the main control room or a floating FLX plugged in locally in the studio. YouTube Space London is truly an amazing place and I can't wait to see what emerges from the studios in which we were so heavily involved. At the very least, I have no doubt that whatever is created is going to look very good indeed.